Please refer to our stock # 1788 when inquiring. Zoomorphic Iron Age III Terracotta Juglet, ca. 800-586 BCE. Zoomorphic vessel. The round eyes of this vessel and the two projections on the head probably represent horns, and therefore classify this animal as a bull. 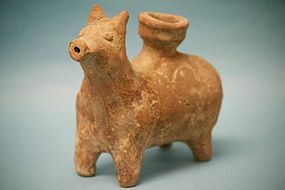 These bull shaped pottery figurines were common in Canaan in the 2nd millennium BCE. The potter did not attempt a realistic depiction of the animal, but rather a schematic one. 3 1/2" in height. Repaired but a wonderful representation of this type of vessel.